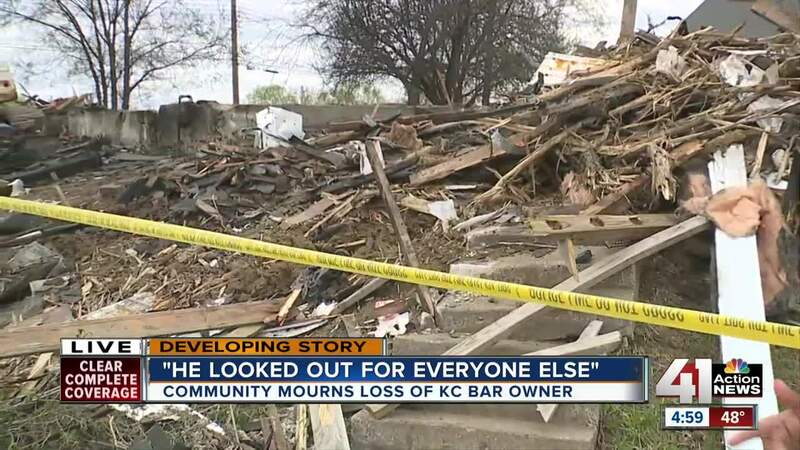 Authorities have yet to formally identify the man who died Wednesday in an explosion and fire that destroyed a house near East 15th Terrace and Fremont Avenue in Kansas City, Missouri, but property records and friends indicate it was a local bar owner, Melvin "Lee" Mecker, who died. KANSAS CITY, Mo. — Investigators spent much of Thursday sifting through piles of debris, searching for clues on what led to Wednesday's deadly explosion and fire at a home in northeast Kansas City, Missouri. "Go through it all — look for anything that might be an ignition source," Kansas City Fire Department Deputy Chief Jimmy Walker said. Authorities have yet to formally identify the person who died in the explosion and fire, which destroyed a house near East 15th Terrace and Fremont Avenue. Property records indicate the house belonged to Melvin Mecker. Friends also have identified Mecker, who went by Lee Mecker, as the man whose body was found in the rubble of the house after it exploded, caught fire and collapsed shortly before 4:15 p.m. on Wednesday. Mecker owned Buddies, a bar at 3715 Main St.
Christopher D. Doyle left a tribute to Mecker on the Buddies KC Facebook page . KCPD investigators were at Buddies Thursday morning. Eileen Norris, who owns the building that houses Buddies, said she has known "Lee" for more than 20 years. "He had a wicked personality," Norris said. "He had a dry sense of humor, which is not for everybody." Many are remembering Mecker for his acts of charity, which ranged from raising money to grilling food for the less fortunate. "He looked out for everyone else, you know," Mecker's friend, Eugene Wheelington, told 41 Action News. Melinda Hudgens, who owns Sidestreet Bar on Gillham Road, said she is also mourning the sudden loss. "He’s just been a part of our life for decades," Hudgens said. Conner Box bartended at Buddies for three months and met Mecker four years ago. "He was a very well-spoken person for the LGBT community and how well he treated everybody," Box said. "What a kind and sweet person he was." The Kansas City, Missouri, Fire Department had yet to determine a cause for the explosion. Walker said Thursday that power and gas had been shut off to the house, but there were a lot of generators and possibly lots of gasoline present on the property. He said the fire wasn’t considered suspicious at this time, but that the investigation remains ongoing. The KCPD Bomb and Arson Unit also is assisting with the investigation. Mecker posted a photo of a missing dog Jan. 12 on his personal Facebook page, pleading for Keara’s return. A dog, which appears to be Keara and that witnesses told police lived at the now-exploded home, was taken to the KC Pet Project this morning. The fire department said Thursday a second dog died in the fire.